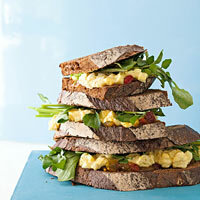 Give your egg salad sandwich some exotic flare. Combine eggs, mayonnaise, vinegar and curry powder; season. Spread 2 bread slices with chutney. Top with egg salad, watercress and remaining bread.